Properties in Romieu Gardens average 4.7 out of 5 stars. Lots of charm and comfort for this stone barn Corsica. Property 11: Lots of charm and comfort for this stone barn Corsica. House Cap Corse, feet in the water with unobstructed view of the sea! Property 17: House Cap Corse, feet in the water with unobstructed view of the sea! Small country house: Very large property with pool. Property 24: Small country house: Very large property with pool. Property 33: Rare, Cap Corse seaside. House with large garden and direct access to the sea. A spectacular apartment with an exceptional host! We stayed at this property for nearly a week in early August and couldn&rsquo;t have had a more spectacular vacation. Our host, Laurent, was present to greet us with the keys and to show us around the newly built, California style loft that had been constructed adjacent to his home in Bastia. From the first moment he made us feel more like long-lost friends than guests. He went above and beyond to ensure we were comfortable with the apartment, explaining all the features. He offered us guidance and insight on itineraries and places to visit within Corsica and was kind enough to help with and make reservations at sought after restaurants. Maid service was provided every other day, and we were greeted with fresh baked bread and croissants upon our arrival. Maps and guides of Corsica in the house will help you to plan your daily excursions. In the evenings, you will be able to enjoy a glass of local rose on the terrace while reflecting on the day&rsquo;s activities. Simply put, it was 5-star service. 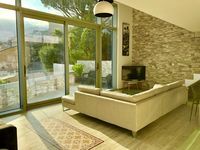 If you&rsquo;d like to experience and explore the splendor of Corsica and stay in a beautiful and well-maintained apartment with a knowledgeable and engaging host attuned to providing an exceptional experience, this apartment is for you. We intend to go back soon!